Judy The Beauty, with 5/1 odds, will break from post position #8 with jockey Joel Rosario in the Ballerina Stakes on Friday, August 23, 2013 at Saratoga Race Course. 2013 Ballerina Stakes; Judy The Beauty Ready To Dance: The 33rd running of (GI) 2013 Ballerina Stakes takes place Friday, August 23rd at Saratoga Race Course in Saratoga Springs, New York. The race is named after Howell E. Jackson’s filly Ballerina, who won the 1954 inaugural Maskette Stakes, as it was then titled, before they changed the name in 1979. 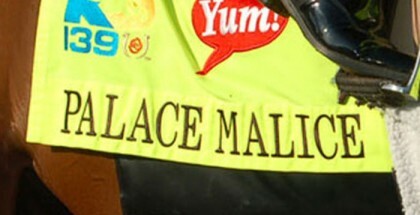 This (GI) race is for fillies and mares 3 years-old and up, run at 7f in the dirt with a purse of $500,.000. Trainer Claude (Shug) McGaughey hold the most Ballerina Stakes wins occurring in 1984,1988,1991,1994 and 1999. Trainer Todd Pletcher has won this race the past two years, 2011 with Hilda’s Passion and 2012 with Turbulent Descent. 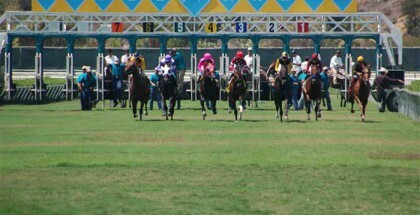 The Ballerina Stakes has been won twice by the filly Shine Again in 2001 and 2002. For the win in the 2013 Ballerina Stakes I’m going with one of my favorites, the Wesley Ward trained Ghostzapper filly Judy the Beauty. Judy the Beauty comes into the Ballerina off two second place finishes. She was beaten by a nose by Emma’s Encore last summer in the (GI) Prioress at Saratoga and recently in the (GI) Princess Rooney Handicap at Calder on July 6th where she had a hard time getting up with a slow pace and a wide trip. She was beaten by Starship Truffles. Judy the Beauty worked five furlongs in 58.22 and galloping out six furlongs in 1:11.47 with Jockey Joel Rosario aboard recently at Saratoga. Ward seems confident Judy the Beauty will run huge here in the Ballerina Stakes and I think this filly is training well and in superb form. Judy the Beauty exits post #8 with J.Rosario in the irons for the 2013 Ballerina Stakes. Last July, just over a year before selling for six figures, she was claimed for $6,250 at Calder Race Course. Starship Truffles will break from post position #6 with jockey Luis Saez in the 2013 Ballerina Stakes. Starship Truffles is a kind of rags to riches story and I like her in the 2013 Ballerina Stakes too. Last July, just over a year before selling for six figures, she was claimed for $6,250 at Calder Race Course. Starship Truffles makes her first start for Castleton Lyons, who purchased her at the July 15th Fasig-Tipton horses of racing age sale for $1 million, she remains under training with Martin Wolfson. She is also a 4 year-old Ghostzapper filly who won the six-furlong Princess Rooney by 3 3/4 lengths over Judy the Beauty last out. She has won 14 or her 24 starts and is scary good right now. Luis Saez comes to ride her from post #6. For my longshot pick I’m going with the Michelle Nevin trained allowance winner Fantasy of Flight. The 5 year-old Tiznow runner was second in the Bed o’Roses by 2 3/4 lengths and second in the Vagrancy Stakes by a half length. 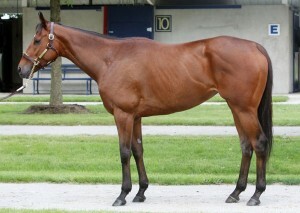 She comes into the Ballerina off a runner-up finish on July 22nd in an allowance going a mile on the turf at Saratoga. She will have blinkers added and I like the equipment change. An equipment change is usually a plus for me, aside from the Palace Malice freight train fiasco in the Kentucky Derby, it sometimes pays for me to bet on ones with blinkers added. Fantasy of Flight exits post #10 with C. Velasquez in the irons. Dance to Bristol is coming off a six race win streak and she’s finished first or second in 16 of her last 17 career starts. She has been competitive in every career win and she’s taking a step up in competition and class here. This filly is on fire and the one to beat Friday. Her odds aren’t bad at 3-1 but I think she’ll get bet down as one of the favorites. I’m going to try and beat her and Book Review. Book Review is the most decorated filly of the group but she’ll have to beat me at the window with odds of 5/2 and those will probably go lower also. 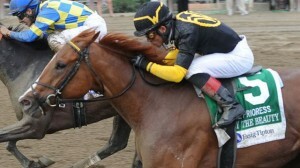 For the 2013 Ballerina Stakes I’m looking for Judy the Beauty to win. Ward has her training fantastic and seems very positive about her in this spot. She has been seeking the elusive (GI) and reminds me of my favorite Mucho Macho Man, who is still seeking his (GI). Ironically, they both have Holy Bull in their pedigree who is one of my favorite older sires. I hope she can get it in gear her and dance her way up the track and score first. Behind her I like Starship Truffles, Fantasy of Flight with Book Review or Dance to Bristol to hit the lower part of the board come Saturday. Go Girls!! Good luck to all of the connections, safe run. The 2013 Ballerina Stakes is a Breeders’ Cup Challenge race with a “Win and You’re In” paid berth for the Filly & Mare Sprint and there is a full field of 11 fabulous fillies looking to win that spot. It is the 9th race of the day with post time set for 5:20 PM EDT.